An old standby long run route is going to look different for a while thanks to some infrastructure improvements in Bethesda and Rock Creek Park.Purple Line construction in Maryland will close the Georgetown Branch Trail for 4-5 years starting Tuesday, Sept. 5, sending runners and cyclists onto a detour through Bethesda and along the narrow Jones Bridge Road sidewalk. Current plans are to reopen the trail, paved, alongside the light rail system. In addition to adult runners, the Georgetown Branch Trail served the nearby Bethesda-Chevy Chase track and cross country teams, which have been without a track for more than a year. “The trail though has been nice for tempo runs and fartlek runs and we even used it for our 1 mile assessment for our indoor and outdoor track tryouts,” said coach Chad Young. 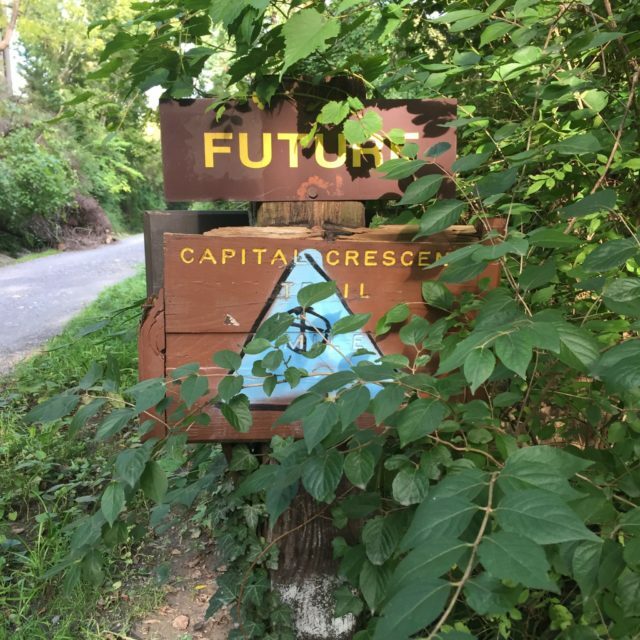 “Our team especially likes to use the trail for easy runs and for connecting down to the Rock Creek Park trails. Now the Barons will be navigating the narrow sidewalks along East-West Highway. The loss of the trail also means a new route for the last few miles of the Parks Half Marathon, which will now finish near the Grosvenor-Strathmore Metro station. At the same time, the reconstruction of Beach Drive between Tilden Road and Joyce Road in Rock Creek Park will force weekend runners up and down Ross and Ridge drives, which will be closed to traffic around the clock. That closure is expected to last one year. There are detours, along a hilly dirt trail on the western bank of Rock Creek directly opposite Beach Drive or the very technical Valley Trail, uphill from Beach. The official detours will combine to add a mile, substantial hills and foot traffic to one of the D.C. area’s most serviceable long run routes, what is colloquially called “the Big Loop,” which follows the Capital Crescent and Rock Creek trails for a total of 21 miles. This detour, using Wisconsin Avenue and Western Avenue in place of the Georgetown Branch Trail and Meadowbrook Park, is comparable in distance. It remains to be seen, pending comment by the National Park Service, whether the detour on Ross and Ridge drives will be plowed and salted during the winter, as Beach has been.The official detours will add a mile, hills and tight sidewalk navigation to the loop. RunWashington offers a few alternative 20-mile runs, along with alterations in case you want to run to the loops but not go too far. None of them are out-and-backs, because face it, anyone can do that. The best chance for a straightforward 20 miles comes from MacArthur Boulevard, between Georgetown and Cabin John, and the C&O Canal Towpath. A bike lane runs parallel to MacArthur, though faster moving cyclists tend to stay on the road. The best opportunities to drop down to the canal are near Backyard Road (for the 20+ mile loop), or 79th Street in Cabin John (for a 14.5 mile loop). Water fountains are available at Fletchers Boat House, the trail between the Towpath and McArthur near the Marsden Bridge and Glen Echo Park. There are also several gas stations and convenience stores along McArthur. The northern addition to the Anacostia Riverwalk Trail, between Benning Road and Bladensburg, opened last fall, and the path is great. It’s become one of my go-to routes from my office near Union Station. I like the rolling hills on Bladensburg Road and Colmar Manor Park. The winding path near Kenilworth Aquatic Gardens can make it hard to see cyclists coming, but so far it isn’t a high-speed corridor. The loop runs a little short, but a loop of the Anacostia Skating Pavilion at the start and end of the loop makes it close to an even 20 miles. A transit-accessible route. Starting at the Wiehle Road Metro station, take the W&OD Trail to the Four Mile Run Trail and turn on to the Mount Vernon Trail. You’re spending a while running in a single direction, but it’s a long gradual downhill after mile six. You’ll pass through several commercial areas if you need to stop, including a 7-Eleven in Falls Church right off of the trail. A mostly-natural surface loop in rural Montgomery County that gives you five miles of the C&O Canal Towpath Trail, starting at Edward’s ferry and running to White’s Ferry, then come back on River Road. It’s a delight. There’s very little traffic on River Road, and the loop lends itself to running it twice. Try getting one loop under your belt and then pushing the pace the second time around. Be sure to catch the right turn on River Road after it passes Fairbanks. Don’t trust that someone won’t throw a water bottle away if you leave it sitting out at Edward’s Ferry. By the time you reach River Road’s intersection with Falls Road on your way home, you’ll have an appetite for Potomac Pizza or Vie Da France.